Unpleasant Questions: Are 'N-Word' Tape Rumors Remotely Credible? If So, Then What? Lynne Patton, a former assistant to Eric Trump and now a Department of Housing and Urban Development official [and one of the campaign officials featured on Omarosa's recording mentioned above], pushed back on Manigault Newman's claims. In a statement, Patton said she got a call from her on the day she was fired, “informing me that she had personally heard a second-hand recording of President Trump using the ‘N-word’ in a derogatory fashion.” In that call, she said, Manigault Newman claimed she voluntarily “submitted her resignation” to Kelly and recommended that Patton “should promptly do the same before the audio surfaced.” Manigault Newman claimed this week that the original source of the alleged tape was former “Apprentice” producer Bill Pruitt. But Patton said she spoke to Pruitt, and he has “NEVER had an audio tape” of Trump using the slur. I think deep down we know an n-word tape wouldn't move Trump's numbers one way or the other. 2) I don't want to see what further depravity that tape would reveal on the right-as once again all too many of his defenders would rally to defend the indefensible. There comes a point when the downside of a primary run (namely, the massive backlash against conservatives that would follow) is dramatically outweighed by the downside of another Trump top-of-the-ticket run. An n-word tape would shift that math. (4) A significant number of Republican lawmakers would strongly (and rightly) condemn Trump, re-opening a schism within the party. Trump loyalists would be furious at those who "pile on" over their "disloyalty," brewing deep resentment among Trump-averse conservatives. Do you think he’d lose support from his base? Do you think he’d pay a price for lying about the tape’s existence? Or for using the N-word? I do not. Everything we know about the president's base supporters suggests that there is no straw that will break the camel's back—only goalposts, receding constantly to the horizon. And if the last two years are any guide...then Trump is already resting on his [public opinion] foundation...Let’s pretend that Trump could hollow out, that an N-word tape would finally be the straw that breaks the camel’s back. Let’s pretend that Trump’s approval collapsed among Republicans. What then? He’s not going to resign. He’s not going to be impeached and removed from office. The #Resistance fantasy is that some deus ex machina will make Trump disappear. This is not going to happen. The only way Trump leaves is if he loses re-election in 2020. For both good and ill, President Trump is our reality and he will continue to affect the world around him...If you look at the Trump administration and think it can’t get worse, then you haven’t contemplated what a scorched-earth Trump might be like. 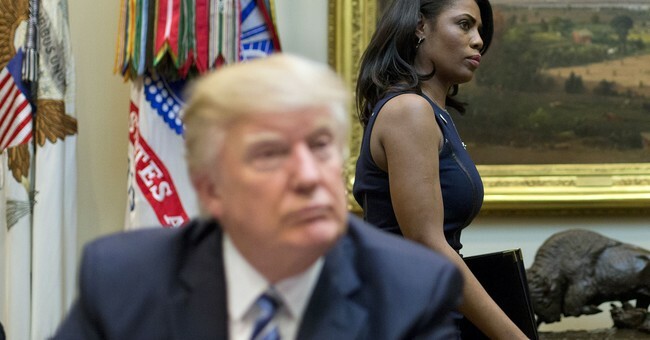 For all sorts of reasons, let's hope Omarosa is completely full of it on this, as she seems to be on any number of matters -- and that her appalling say-anything, self-promotional sideshow proves to be a fleeting media fascination that quickly fades from the spotlight. Parting throught, via Allahpundit: This situation feels like a prime opportunity to unleash the disorienting chaos of "DeepFakes," doesn't it?